The she-wolf suckling the twin infants, Romulus and Remus, is a symbol of the city of Rome. According to the legend of the founding of Rome, Aeneas, son of Venus, was the greek mythological character who fled Troy when it was sacked in 1184 BC during the Trojan War. wandered for a while, and started a new life in Italy along the Tiber River. A descendant 14 generations later was the Vestal Virgin Rhea Silvia, who was impregnated through ramp by the god Mars. She bore the twins Romulus and Remus, but since she was a Vestal Virgin they were condemned out of shame by their uncle Amulius to be drowned in the Tiber River. However the area surrounding the river was marshy from recent flooding, and the soldiers who were selected for the job didn't want to sludge through the muck to get to the river, so they just left the babies in the marsh. As the flooding dried, a she-wolf found the babies, suckled them to keep them alive, and a herdsman named Faustulus found them and he and his wife named Wolf raised the boys. As young men, they returned to the place where they'd been abandoned. Romulus took up residence on the Palatine Hill and Remus lived on the Aventine Hill. They fought for control, Romulus killed Remus, and the city of Rome, named after Romulus, it's first king, was founded in 753 BC. It's all an unbelievable tale, but somehow there have been stone huts found on the Palatine Hill which can be dated to about the right time, and a cave has been found nearby with some sketchy evidence suggesting it's the spot where the she-wolf suckled the babies. 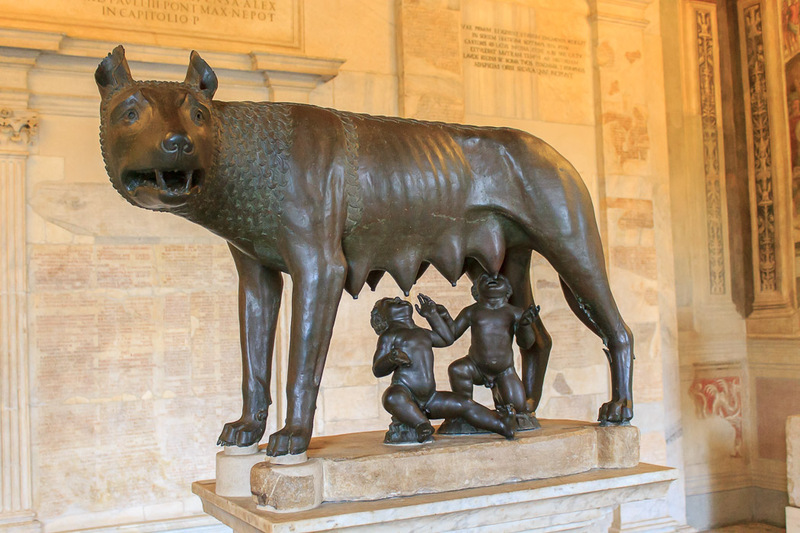 Anyhow, the she-wolf was obviously quite important in the legend of the founding of Rome since the babies would have starved, so her action is celebrated in sculptures and paintings. 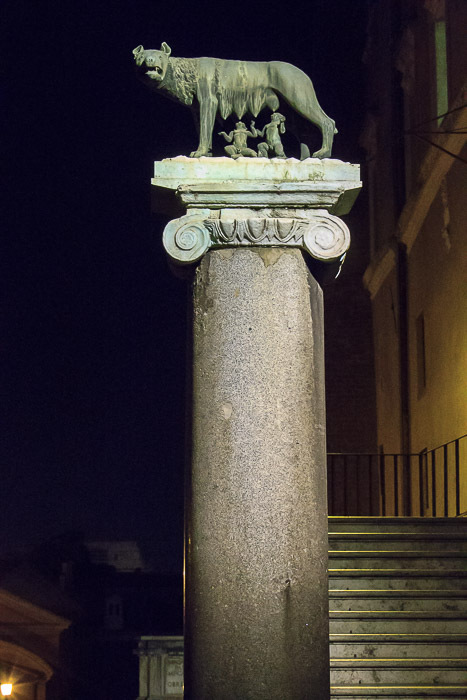 The most famous is the Lupa Capitolina, or Capitoline She-Wolf (1st photo below), a bronze sculpture which has been in the Capitoline Museum since 1471. The wolf is a bit larger than life-size, with alert ears and intense eyes watching for danger. The babies are suckling the udders of the wolf, oblivious to any danger. Several ancient sources describe statues of the wolf suckling the twins and it was widely assumed that this is that statue. The wolf was even dated on stylistic grounds to an Etruscan sculptor, Vulca di Veii, in the 5th century BC, although it was thought that the babies were added in 1471 or later. Subsequent radiocarbon dating has resulted in the wolf being sculpted between 1021 and 1153, to a 95.4% level of certainty. Jeez, those scientists can sure ruin a great legend, can't they? I think it's a lot more fun to just believe the founding legend at face value by believing that the Capitoline She-Wolf is a copy of the original which was sculpted by a 5th century BC Etruscan, and that Julius Caesar was indeed a descendant of the goddess Venus by way of the Trojan prince Aeneas.